SLPRB AP Police Constables PMT/ PET Hall Tickets/ Call Letter at recruitment.appolice.gov.in. 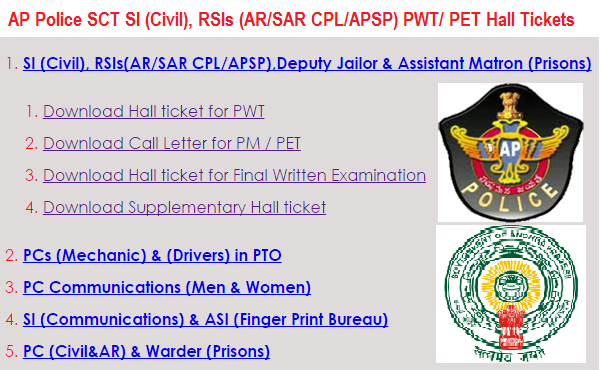 AP Police SCT SI (Civil), RSIs (AR/SAR CPL/APSP) Physical Measurements Test, Deputy Jailor Physical Efficiency Test Hall Tickets, Assistant Matron (Prisons) PWT/ PM / PET Hall Tickets Download. SLPRB AP SCT Police Constables (Communications) Recruitment 2016 PMT/PET Call letters Download official website. PCs (Mechanic) & (Drivers) in PMT/ PET Hall Tickets, PC Communications (Men & Women) PMT/ PET Hall Tickets, SI (Communications) & ASI (Finger Print Bureau) PMT/ PET Hall Tickets, PC (Civil & AR) & Warder (Prisons) PMT/ PET Hall Tickets Download. Physical Measurements Test, Physical Efficiency Test is likely to be held in the first week of November, 2016, at PWT/PET Centers. AP Police Constable (communication) SLPRB Physical Measurements Test & Physical Efficiency Test 20-10-2016. Hall tickets Download and Save it for further details.